The small, red piri piri chili pepper is commonly found in parts of Africa and in Portuguese colonized areas of South America and the Far East. Portuguese travelers gathered the peppers from areas they settled in and developed a spicy and citrusy condiment with them called Piri Piri Sauce. You are likely to see Piri Piri Chicken or Piri Piri Shrimp on Portuguese menus. These dishes are gaining in popularity in North America as well. It is possible to find piri piri pepper flakes or powder in the international aisle of your market. If not, it is easy to find online. If you can’t find piri piri, you may substitute cayenne pepper for the recipe outlined here. Some pepper aficionados claim that piri piri is hotter than cayenne, while others claim it is the same or a bit milder. I would err on the side of caution when substituting with cayenne. This is a spicy dish that is cut by the acid component. This recipe calls for marinating boneless chicken thighs, then grilling on a George Foreman Grill. 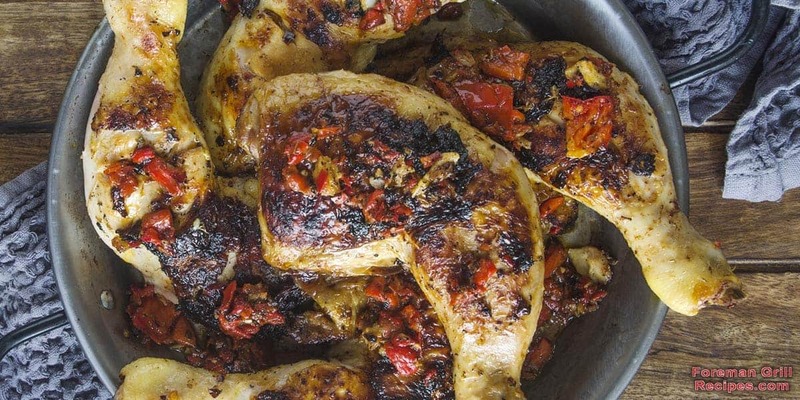 Most Piri Piri Chicken recipes call for using the darker cuts of poultry. This dish is often served with boiled or roasted potatoes (recipe follows). This recipe will feed 4. Preparation time is approximately 20 minutes. Marinating is 4 to 24 hours. 1. In a small food processor, add the 7 marinade ingredients and pulse until almost smooth, similar to a pesto. 2. Place the chicken thighs in either a plastic sealable baggie or a glass baking dish. Pour the piri piri marinade over the chicken and massage gently to completely coat the meat. Seal the bag, or cover the dish and place in the refrigerator for 4 to 24 hours. 3. Remove the marinated chicken from the refrigerator approximately 30 minutes before grilling to allow it to come almost to room temperature. 4. Preheat your George Foreman Grill to high. Coat the grill plates with olive oil, using a paper towel in tongs or using a spray. 5. Place the thighs on the grill and close the top. You can do 2 at a time if using the smallest basic grill. Cook for 8 to 10 minutes until the internal temperature reaches at least 165 degrees F. This will depend on how thick the thighs are. 6. Remove the chicken to a cutting board. Tent with foil and allow to rest for 5 to 10 minutes. You can boil the potatoes while the chicken is marinating and set them aside to cool or put them in the refrigerator overnight. This recipe takes approximately 40 minutes total prep and cooking time. These will serve 4 people. 1. Place the whole potatoes in a deep pot and cover generously with cold water. Bring to a boil. Turn the heat down to a rolling simmer and cook the potatoes until they are just tender, but not mushy, when pierced with a sharp knife. They should still have a slight firmness to them, as you will cook them through on the grill. Whole potatoes take anywhere from 20 to 30 minutes to cook in boiling water. 2. Drain the potatoes and allow them to cool, or place in the refrigerator until you are ready to grill the chicken. 3. Before you grill the chicken, slice the cooled potatoes into 1/4 to 1/2 inch thick rounds. Place them in a bowl and toss to coat with the EVOO, paprika, salt, and pepper. 4. While the grilled chicken is resting, grill the potatoes, with the top closed, in batches, adding oil to the plates, if necessary to prevent sticking. You just want to get some nice grill marks and warm them through. This will take anywhere from 2 to 4 minutes. 5. Season the potatoes with a little salt and pepper and serve with the chicken. Note: If you would like to serve the chicken with a little extra piri piri sauce on the side, double the recipe. Do not use the marinade that the raw chicken sat in! This condiment should last a couple of weeks in your refrigerator in a glass jar with a tight lid.